A scarlet Valentine’s heart, edged with gold and tied with a navy satin ribbon, recently arrived at my door. I am by no means immune to the romance of heart shaped packages, so it was with a tremble of anticipation that I picked up the Charbonnel et Walker box. At first I wondered, but no, CT had nothing to do with it. It was a good sized sturdy box containing thirty two chocolates weighing a whopping 400g. The chocolates were a mix of 33.5% milk and 60% dark chocolates containing traditional fillings of fondant, marzipan, ganache, caramel and praline. Rather less traditionally, the chocolates were of good quality if a little on the sweet side. These are not fresh artisan chocolates after all and shouldn’t be judged as such. I always get a little paranoid when there is no chocolate in the house, so I was delighted to receive such a large box of chocolates. I’ve not had the pleasure of trying Charbonnel et Walker before, although the name is a familiar one. I have long wanted to try their famous rose and violet creams – I do have rather a soft spot for these very old fashioned, but nonetheless iconic flavours. Sadly, neither of these were to be found in this particular box. Another time perhaps. Founded in 1875, Charbonnel et Walker is one of Britain’s oldest chocolatiers. Unusually for the time, the business was founded as a partnership between two women, the English Mrs Walker and the Parisian Mme Charbonnel – a specific request from the Prince of Wales, later to become Edward VII, it would seem. A number of aristocratic and fashionable clientele have given C et W their patronage, including Princess Diana, Sir John Gielgud, Wallis Simpson and Noel Coward; the latter was so enamoured he had a box delivered to his home fortnightly. Today, the royal seal of approval comes from the Queen herself and they are one of only a handful of chocolatiers to hold a Royal Warrant. This box can be bought for £38 either online or at the Bond Street shop, the very same one that opened all those years ago in 1875. 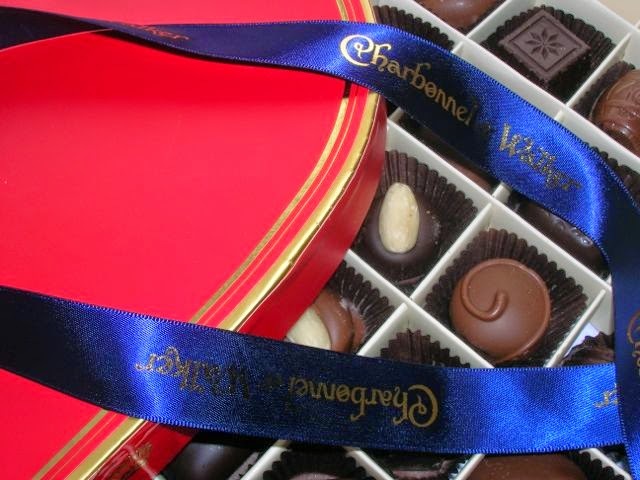 Other heart shaped boxes to tempt your Valentine this year include pink champagne truffles and sea salted caramels. Hunting around in a large box of chocolates for the one you want is not an easy task and after trying a few that sounded particularly good, it was lucky dip. The menu card was rather charming in design, but not the most helpful in identifying the specific chocolates. Many were on the card, but were not present in the box and I spent some considerable time trying to find them. Always one to avoid a strawberry fondant, I found the one in this box to be surprisingly good. The dark chocolate ameliorated any sweetness and the flavour was good. Not surprisingly with such a large box of chocolates, they have lasted for quite some time and are not finished yet. Being a bit of a marzipan addict, I was pleased to find there were quite a variety including a rather nice one flavoured with Orange Cointreau. CT liked the coffee chocolates, but here are a few of my favourites. Ginger Marzipan – was my first choice and I wasn’t disappointed. A dark chocolate containing marzipan flavoured with ginger and a good dose of rum. There was no mistaking the flavours here and the warmth of the ginger lingered long on the palate – just what is needed in the depths of winter. Blend Crown – a delightful mix of hazelnut praline, marzipan and whisky all wrapped up in dark chocolate. Pomponette – a blend of marzipan and pistachios enrobed in dark chocolate – did I mention I’m a bit of a marzipan fan? Cecily – with its caramel flavoured truffle centre and enrobed in dark chocolate was elegantly simple to look at, but with a hidden decadence. Barrel – this rum and raisin chocolate was a real nostalgic one for me. When I was a nipper, I would sometimes spend the whole of my 6d pocket money on a bar of Old Jamaica and this bought back all the joy of those occasions – À la recherche du temps perdu. Rum Fourré – I think I must have a thing about rum too, because I really liked this one as well. A buttery ganache flavoured with rum which warmed my mouth and throat quite delightfully. With thanks to Charbonnel et Walker for the box of chocolates. I was not required to write a positive review and as always, all opinions are my own. Thanks Rachel, you are well ahead of me there. These are certainly iconic chocolates, I love their marzipan and champagne truffles! Mmmm, with a big box like that I never know where to start! And I’m with you on the strawberry (and orange ones) too! Lovely box of chocs, hope CT doesn’t think that gets him out of getting you some for Valentine’s Day! Haha Janice, I’m not sure CT has ever bought me chocolates for Valentine’s Day. Do you ever get lucky? Lucky indeed. It sounds you are well versed in their delights and now I’ve heard of salted caramel and banana, I’m very keen to try those too. I need to leave this webpage open where my husband can see it in the hope he’ll get the hint! !